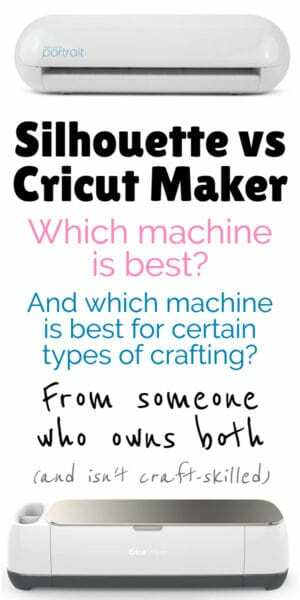 The Circut Maker and Silhouette can see very similar at first glance, but which cutting machine reigns supreme in 2019? 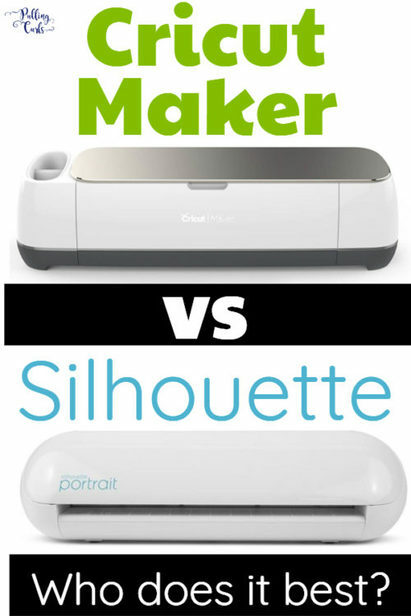 The Cricut Maker and Silhouette machines are both cutting devices, that allow you to creat awesome personalized items and gifts at just a “click of a button”. Let’s start off with full disclosure. I was given both my Cricut Maker AND my Silhouette machine. I was required to write posts for both companies (this particular post is sponsored by Cricut) — but I’m excited to share the differences and which machine is better. 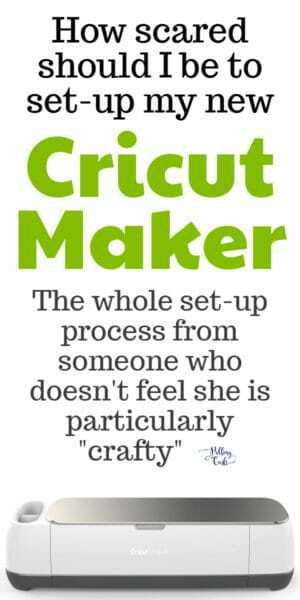 Ok, let’s first talk about the Maker. I remember when the Cricut Maker first was released. The crafting world went WILD. The ability to do paper, vinyl, fabric, tissue, leather, even WOOD? NO. WAY. It really is pretty cool! BTW, the Maker is available at both Cricut and on Amazon — and I’d check pricing to make sure which has a better deal at this point in time. Of course, something that is common to BOTH machines is a “what have I done” mentality when you pull it out of the box! I want to share my set-up video with you guys. I will admit I was fully overwhelmed. Cricut also was generous to send me some supplies as well and… I was just drowning in WHAT DO I DO NOW feelings. HUGE KUDOs to Cricut to making the initial process really easy. I love how that first project includes both fabric and paper and shows you the basics of Cricut-ness. That is a huge bonus, and it made getting into the machine a lot easier (although I wish there were still some instructions on what to do in the box). It really picks blade and pressure for you — no doing it by hand. LOVE the storage compartments, that’s huge for me! 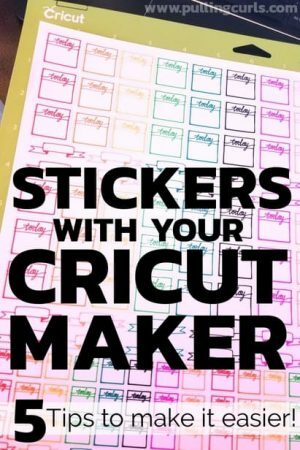 TONS of great tutorials out there, as Cricut has a pretty heavy blogger program, that is awesome! I love the pen function way more than I thought I would — I love the hand-drawn look! This thing is HUGE (now, I only have the Silhouette portrait, so it’s meant to be smaller, but the maker is big and heavy! Set-up was not as easy as I would have preferred, and I had to use a lot of online tutorials to get going and feel mildly comfortable. I wish there was even a paper in your box that tells you what to do. I have had my Silhouette since 2017 — just about 2 years. In that time, I’ve probably used it 10 times? I have really enjoyed making my own planner stickers with it. But, I am constantly futzing with the blade and the pressure and I can NOT seem to get it right, no matter what I do! I have also burned a few things with the iron-on vinyl which have made me reticent to try it again. BUT, for planner stickers — I believe the Silhouette still reigns supreme. Their software is awesome for creating the stickers and then duplicating them down the screen. Great interface on their software (Silhouette Studio) — it is harder to use, but once you get the hang of it, it makes things SUPER easy! However, some people find it WAY too overwhelming wtih all the options! Print and cut is more intuitive also (although, full disclosure, I still haven’t figured it out on the Cricut Maker). It’s so tiny and petite, much easier to get out if I just have a small project. They have fewer materials to pick from (to cut), and you have to change your blade length manually (although, I believe on newer machines it will pick it for you). 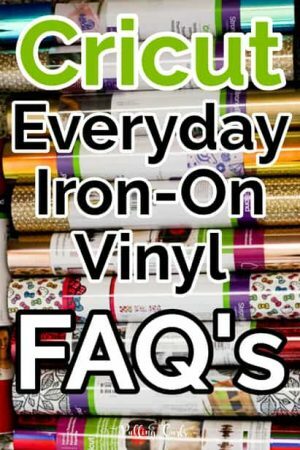 Less branded “help” — Cricut has tons of tools, and vinyls and heat presses. I don’t see as much from Silhouette (although they have the cute Mint which is so fun). If you plan to do stickers — I’d still go with the silhouette (and 100% get Silhouette School’s tutorial on print & cut — because figuring it out without her will take you 12 years). I just think the software is AMAZING for duplication and spacing, etc. If you plan to only do smaller projects, I’d also consider the Silhouette… although, once you get into it — you may well want to do larger projects… and then you’d be stuck. Otherwise — I’m on team Cricut now. It really just seems simpler, for things like vinyl, personalizing things, etc. I really am hoping to figure out print and cut better here in the coming weeks (keep in mind this article was written with less time spent with the Cricut vs the Silhouette). So, maybe my thoughts on stickers will change (although, frankly — everyone I know who does stickers uses the Silhouette, so there’s that). This is the first of 3 Cricut posts, so stay tuned for more of my thoughts about my new machine — and check out any new Cricut posts below that! 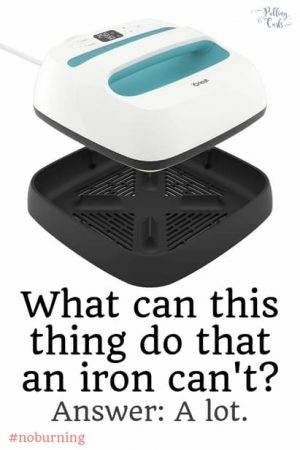 Cricut EasyPress Machine Intro: What can I burn today? I have been watching the Cricut videos and tutorials, even downloaded the Design Space software to get used to it before I received my Cricut Maker. I saved up the money for it, ordered it and then waited and waited and waited for it to arrive. It never made it to me! It was stolen in Commerce City Co on it’s way to me. I was soooo sad!! I had big plans for that machine for Christmas. So I requested a refund, which I got and then my car broke down and I had to use that money to get it fixed. So now I am going to have to save up the money again. This time I will buy it in the local store so I don’t have to risk another one being stolen. I look forward to more feedback on your experience with it. Nooo, that stinks! I have a few coming up! Stay tuned for more!